Cops: Kidnapping suspect flees, causes five-car crash in N.M.
ALBUQUERQUE, N.M. - A suspected kidnapper crashed his vehicle into four cars while fleeing from police Monday after the woman he allegedly abducted texted her sister for help, reports CBS affiliate KRQE. Police said Daniel Romero, 39, kidnapped and beat the unidentified woman around 7 p.m. Monday in Albuquerque, N.M. The victim texted her sister that the suspect had a gun and had threatened to kill her, according to the station. The sister called 911. KRQE reports officers located Romero's car and a chase ensued. Police laid out spike strips along Interstate 25 in an attempt to stop the fleeing suspect. They said Romero managed to avoid the strips but wound up getting into a five-car crash that left none seriously injured. "We looked and we saw the police coming and everybody jumped out with their guns," a witness to the crash told the station. "Then with the way that everything's been happening, I kind of assumed that they were going to end up shooting." 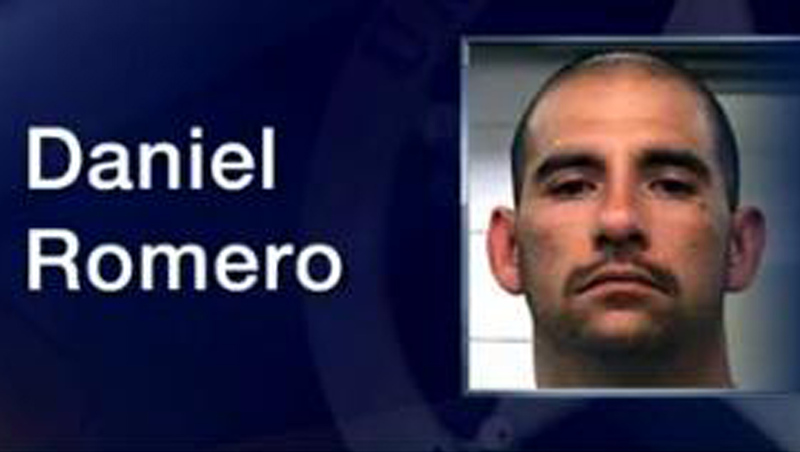 Romero is facing several charges in the incident, including kidnapping, according to KRQE. Police said they are looking for the gun Romero allegedly used to threaten the victim and are investigating whether drugs were involved. The woman reportedly told police she had just met the suspect, who was also wanted by U.S. Marshals on robbery, drug dealing and gun charges.